It's no big secret that I am a full on Foodie. It's nearly impossible not to be when your in a large Italian family. Food is almost a religion and how I do love it all! Naturally, since I do adore food so much, I get really excited when trying out s new culinary subscription box like the Eat.Feed.Love. Taste Club! Eat.Feed.Love. 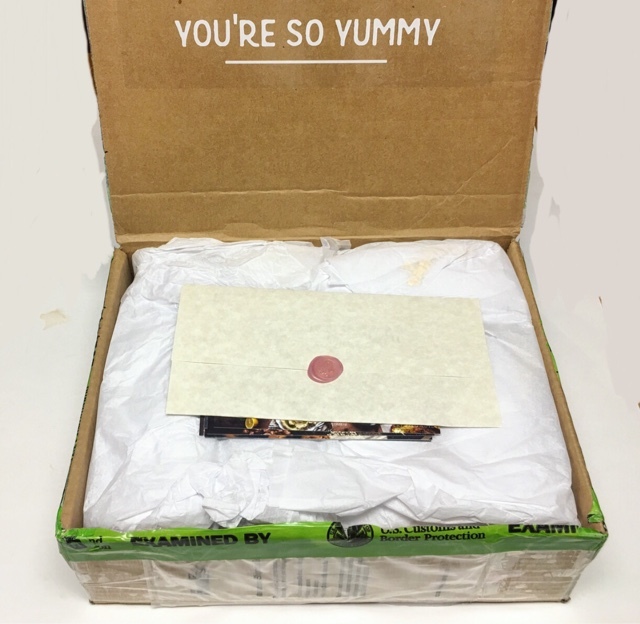 who kindly sent me this box for review, is a monthly culinary subscription service. The cost is $39.99 per month and "you'll receive a delicious box of goodies delivered to your doorstep every month! Each box is packed full of hand-selected artisan products from all over the world, assembled by our genius kitchen team. " Need a little extra incentive to try them out? Eat.Feed.Love. 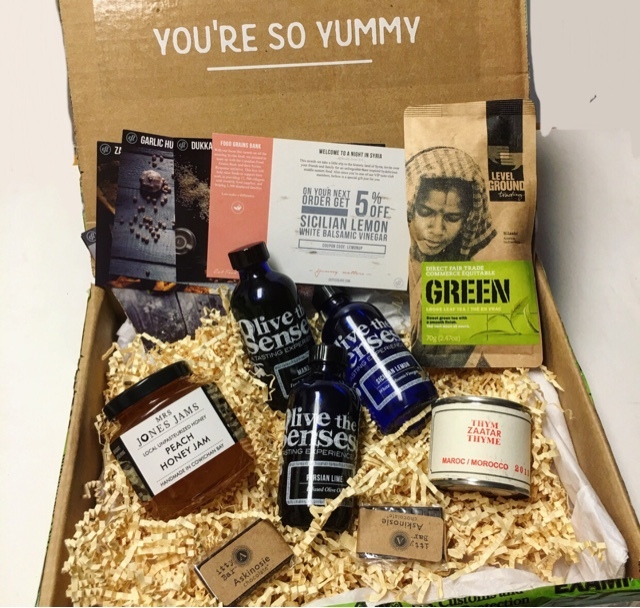 is offering DDG readers 50% off your first box! Just use coupon code DixieDollsGlow at checkout! 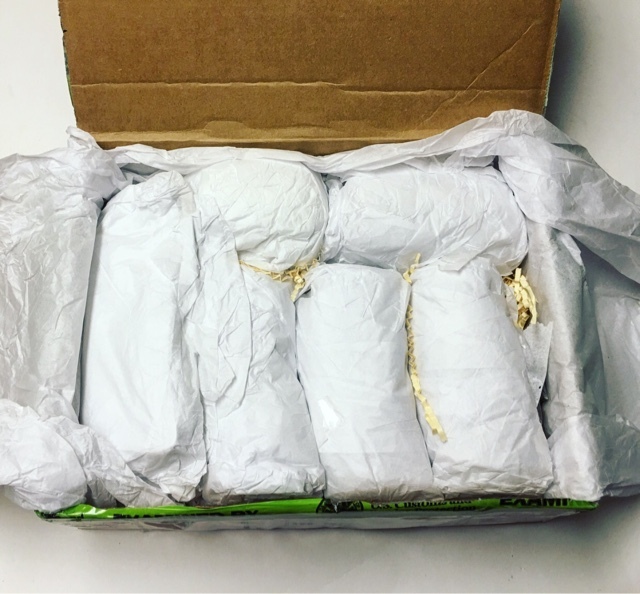 Each item is packaged with a very obvious amount of care. This is something I always greatly appreciate! No one likes to open a box of broken or damaged contents! 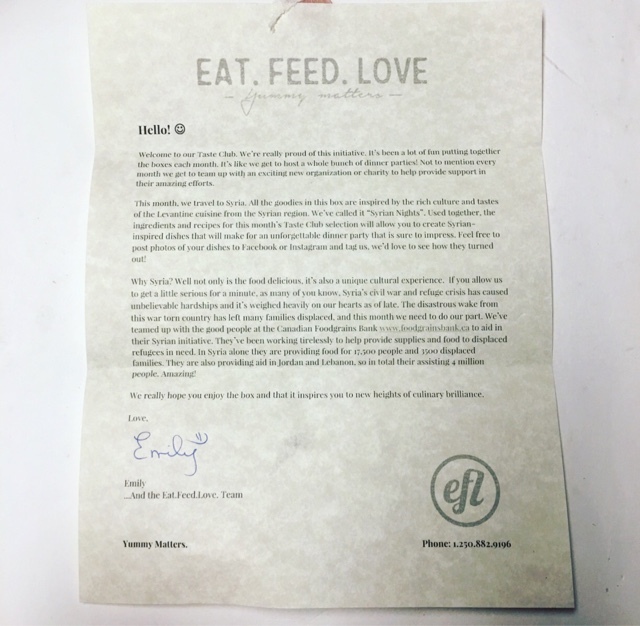 Included is a very nice letter letting you know about the mission of Eat.Feed.Love. and a bit about the months theme and charity. 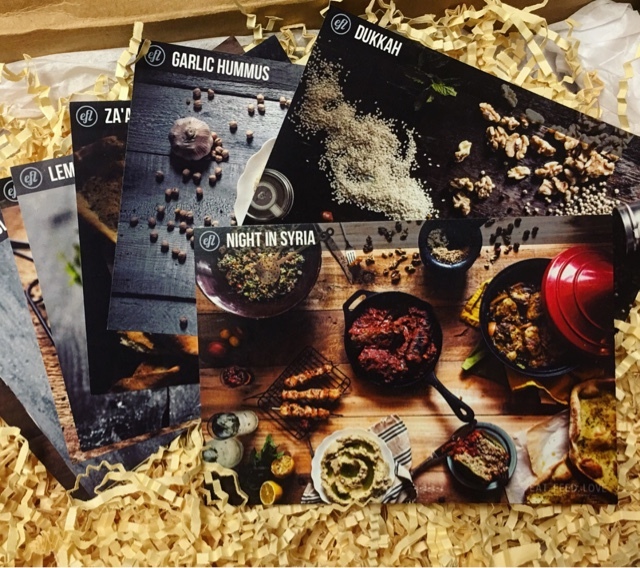 The November box theme is 'Nights In Syria'.and a portion of the proceeds will go to the Canadian Food Bank to aid in their Syrian initiative. 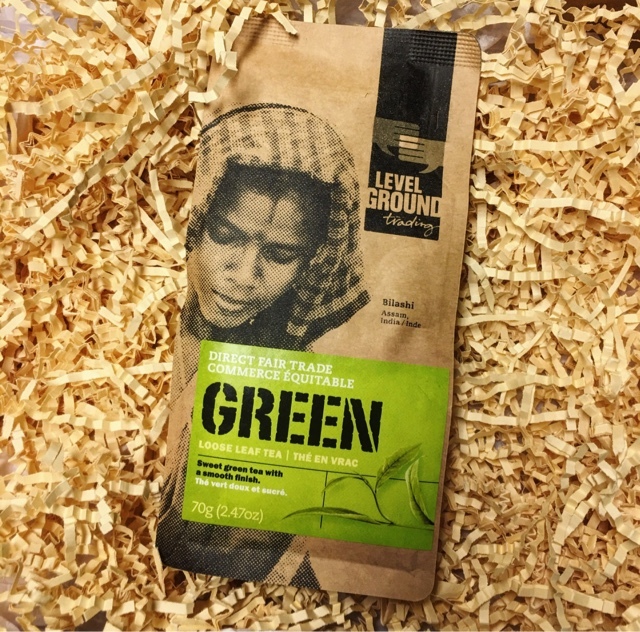 Level Ground Green Tea --- I'm a tea junkie so new ones always make me happy. "A beautiful clear and vibrant green tea grown in Assam, India in close partnership with local farmers, Level Ground's green tea is sweet-natured, with a whisper of honey in every sip. This premium tea is optimal as a 'twice brewed' tea, where the first brew, or 'rinse' is lighter in character and the second brew has a deeper fuller flavor." Mrs. Jones Jams Peach Honey Jam --- I wasn't sure what I would think of this combination but oh my is it good! 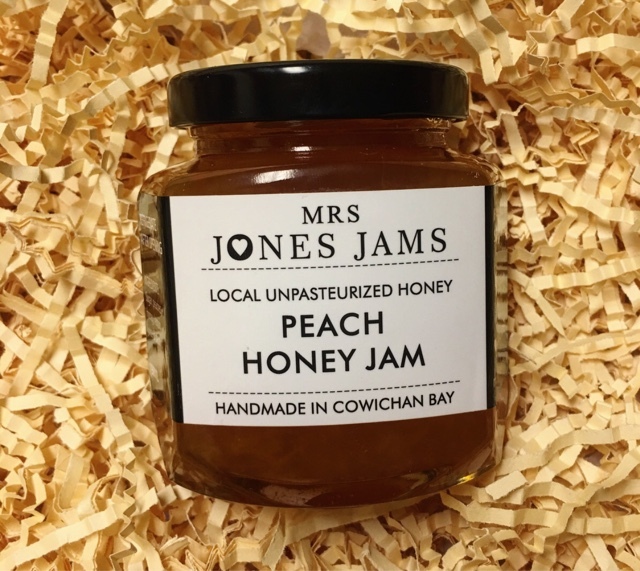 "Created using local unpasteurized honey and ripe British-Columbia peaches, this jam has a delicious golden hue and a thick and sweet nature that is sure to please on French bread or even on an English muffin. Like all of Mrs. Jones' jams, it's slow-cooked in open kettles to achieve the maximum in fruit flavor and depth of character. " Moroccan Zaatar Thyme Leaves --- I love to cook so spices go quickly in my house. "The distinctively delicious flavor of Za'atar seasoning is a staple of Middle-Eastern cookery. 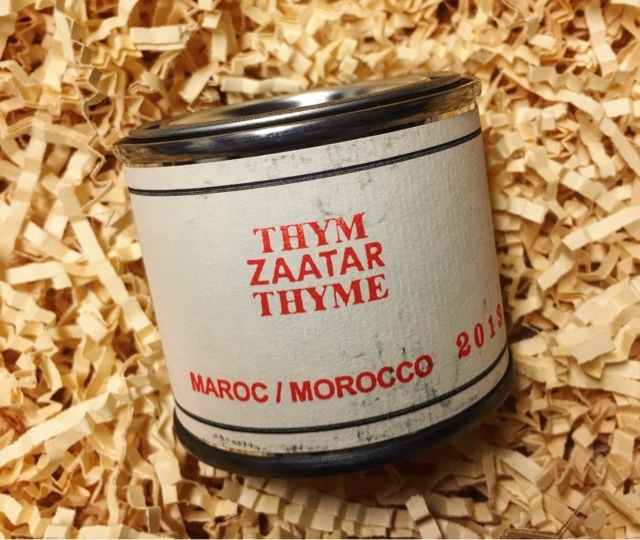 This thyme varietal will impart an exotic touch of ancient tradition to your recipes. Pungent and aromatic, with a rich flavor-profile, it is perfect for seasoning hummus and, mixed with olive oil, as a brush-on enhancement for pita." 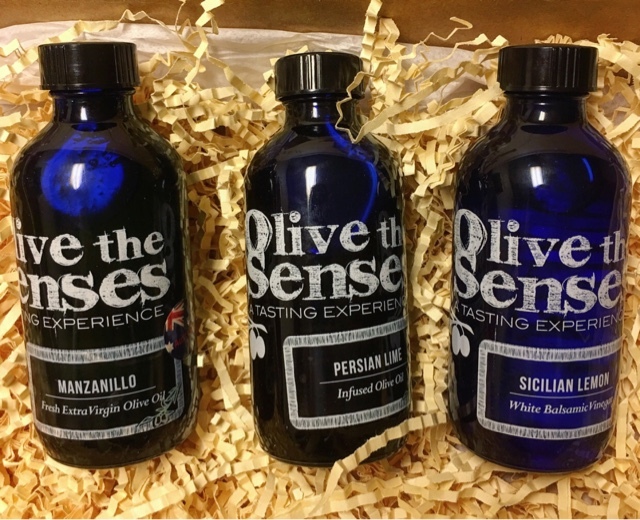 Olive The Senses Vinegar & Olive Oil --- First, I seriously love the blue bottles. They are beautiful. Even better, all of these are phenomenally tasty! The three bottles contain Manzanillo Olive Oil, Persian Lime Vineger and Sicilian Lemon Vineger. I can't wait to start cooking with these! 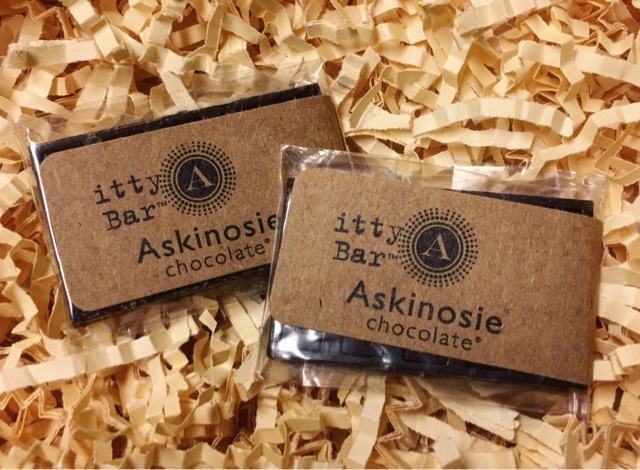 Askinosie Chocolate --- These are the only thing I wasn't over-the-moon about simply because it's to bitter for my personal taste. Also included were these gorgeous recipe cards. Each one sounds delicious!! I am overjoyed with this box! Eat.Feed.Love. has put together some extreamly high quality items that I can't wait to fall in love with. A box that is a treat for you and also manages to give back? That's something we can all stand behind!! 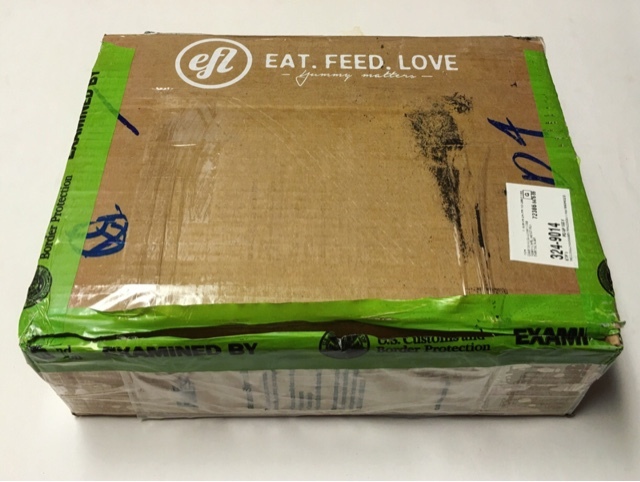 Thoughts on Eat.Feed.Love.. Taste Club? Share with us!